Mountain landscapes are awe-inspiring places where you can gain a real sense of escape. For families they are often popular for skiing in the winter however, during the summer months, they really are true activity playgrounds! Our mountain bases are wonderful, authentic villages, far away from the large concrete jungle resorts that are ski hubs in the winter. In our destinations you experience the real people, place and most importantly some thrilling family adventures. We’ll show you the delights of the Alps in Austria, Bavaria and Slovenia. You can enjoy the Pyrenees of Catalonia, the peaks of Montenegro and, closer to home, our families can enjoy the fells of the English Lakes. On our holidays the hills are alive with the sound of families having some serious fun! With mountains, come valleys and with valleys, come rivers! It is this combination of peaks and waterways that provides such an activity feast. 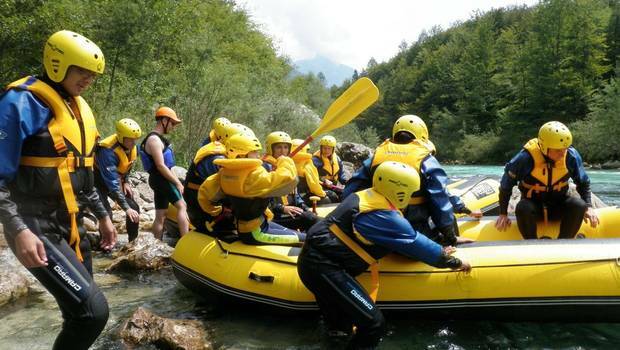 As a family you can experience the thrills and spills of white water rafting on the rapids during our Ultimate Activity Week in Sort, Catalan Pyrenees or choose your river grade as you tailor your holiday in the Oetz Valley. You can witness the turquoise waters of the Soca River in a variety of ways including; kayaking and rafting, as well as fun and games with your guides. You could also try Gyhll scrambling in the Lake District for a chance to experience a natural water park! You can’t stand at the base of a mountain without wanting to see the views from a bit higher up and we’ll get you exploring in a variety of ways! Many holidays do include a hike, now; we aren’t talking major ascents of alpine peaks, more gentle paced hikes to stunning lakes, treasure hunts and challenges. Hiking is not necessarily always top of the list of children’s favourite activities but you be assured that our expert guides make these days far more exciting, ensure you see the best of the region and have a great time! Rock faces are best known as ideal places for families to try climbing and abseiling and this can be done in many of our destinations, including the likes of the Slovenia, the Lakes and the hills of Montenegro. For a serious thrill then families can try their hand at Via Ferrata in Austria, following iron walkways and challenges through the high mountains. A head for heights is a must but the rewards are worth it! Mountain biking is one the greatest ways to explore the mountains, in most cases we stick to the valley bottoms (you’ll be thrilled to hear! ), which allows you to soak up the views and see much more. We do have options for the more adventurous biker and our Travel Experts can always point you in the right direction.